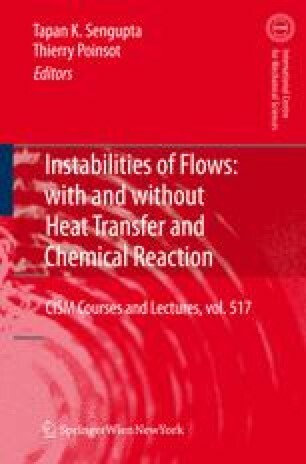 Significant advances have been made in the understanding the process of instability and transition where unstable TS waves are created by a viscous instability mechanism for external flows, as is explained in Chapter 2. Classical approaches to instability studies identify an equilibrium state, whose stability is studied by eigenvalue analysis by linearizing the governing equations. Results obtained by this approach match with controlled laboratory experiments for thermal and centrifugal instabilities. But, instabilities dictated by shear force do not match so well, e.g. (i) Couette and pipe flows are found to be linearly stable for all Reynolds numbers, while the former is found to suffer transition in a computational exercise at Re = 350 (see Lundbladh & Johansson, 1991) and the latter found to be unstable experimentally at Re ≥ 1950 (see Reynolds, 1883), with the exact value dependent upon facilities and background noise level; (ii) plane Poiseuille flow has Re cr = 5772, whilef in the laboratory experiment transition was shown to occur even at Re = 1000 by Davies & White (1928). Interestingly, according to Trefethen et al. (1993) the other example for which “eigenvalue analysis fails include to a lesser degree, Blasius boundary layer flow”. This is the flow which many cite as the success story of linear stability theory.